District Attorney Stacy Parks Miller talks to the media outside the Centre County Courthouse in Bellefonte, Pa. in August 2017. Prosecutors on Monday charged 12 more Pennsylvania State University fraternity members in connection with fraternity pledge Tim Piazza's hazing death, after recovering footage they say had been deleted from a frat house security camera. 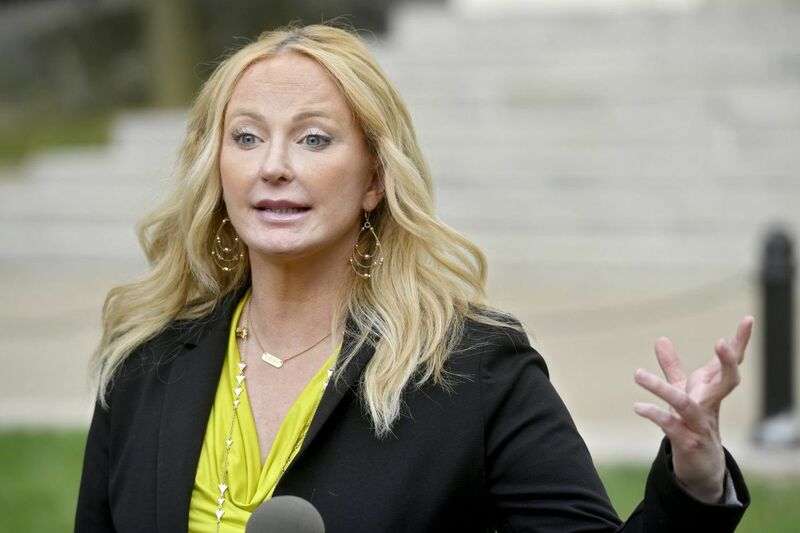 In addition, Centre County District Attorney Stacy Parks Miller accused one member of the now-defunct Beta Theta Pi fraternity – Braxton Becker, 20, of Niskayuna, N.Y. – of deleting the video in an attempt to stifle the investigation. The charges – felony counts against five new defendants and misdemeanors against seven others – significantly broadened what was already one of the largest hazing prosecutions in the nation's history and drew renewed attention to Piazza's Feb. 4 death after a booze-fueled fraternity initiation ritual. But swift condemnation from fraternity members and their supporters only highlighted troubles that have plagued the case in recent months. In September, a magistrate judge threw out many of the most serious charges, saying prosecutors did not have enough evidence to support them. Parks Miller, who recently lost a re-election bid and is due to leave office in January, vowed to fight the ruling and refiled the case last month with a request for a new judge. "I'm perplexed by her approach," said Bill Brennan, lawyer for Joseph Ems, one of the fraternity members added to the case on Monday. "She is a lame duck with legal problems of her own." A total of 26 students now stand accused of crimes ranging from providing alcohol to minors to involuntary manslaughter. Ems, 21, of Philadelphia and Becker were among four fraternity members who were previously charged but saw the case against them collapse when the judge, Allen Sinclair, ruled after a preliminary hearing that spanned eight days over three months. Both found themselves back in legal jeopardy as a result of the newly recovered video footage. At a news conference Monday in Bellefonte, Parks Miller said investigators knew from Becker's text messages that he had deleted security system tapes from the basement camera after Piazza's death but that FBI analysts were only recently able to recover it from the hard drive on which it had been stored. Authorities now believe that Becker wiped the tape right in front of a State College police detective who was sent Feb. 6 to retrieve it. "We know exactly what time it was deleted," the prosecutor said. "It was while police were in the house." The basement footage, she said, showed more fraternity members than were previously known participated in a marathon drinking session, known as The Gauntlet, that was meant to welcome new pledges to the fraternity. The tape depicted Piazza shotgunning drinks during a beer pong game, where members handed the 19-year-old engineering student from New Jersey can after can to chug. "Every drink consumed was provided to him by a fraternity brother," Parks Miller said. "Based on the video, Tim Piazza was furnished with at least 18 drinks in 1 hour and 22 minutes." Footage obtained from elsewhere in the fraternity house earlier this year helped Parks Miller build the grand jury case and chronicled the harrowing last hours as Pizza drunkenly stumbled into walls, passed out for hours and repeatedly fell down a flight of basement stairs. All the while, the footage shows, other fraternity members either ignored or jokingly beat and slapped Piazza — with none calling for help until late the next morning. Piazza died two days later of a head injury, a ruptured spleen and a collapsed lung. As the district attorney described the drinking marathon and aftermath, Piazza's parents stood by shaking their heads. His father, James Piazza, said the fraternity members who did nothing while his son repeatedly injured himself in a drunken haze deserved to be punished. "Hazing is illegal and justice needs to be served," he said. "It's time to man up, fellas, and face accountability for your actions." Those charged Monday with the most serious offenses – involuntary manslaughter and aggravated assault – are: Joshua Kurczewski, 19, of Erie; Ryan Burke, 21, of Scranton; Jonathan Kanzler, 19, of Coopersburg; Bohan Song, of Wayne, Pa.; and Aiden O'Brien, whose age and hometown were not available Monday. In addition to Ems and Becker, the new students facing misdemeanor counts include Brian Gelb, Patrick Jackson, Reggie Goeke, Mike Fernandez and Donald Prior. It was not immediately clear whether any of those charged Monday had retained lawyers. All are due in court for arraignments Nov. 28.